12 Reasons to Make Christmas at the Cave your Holiday Tradition! There is often pressure around the holidays to get the right present, decorate the home and put together the right meals that make everyone happy. And amidst all of the striving to find the right whatever it is, we often forget that what lasts more than gifts, food and decorations, is memories made together. 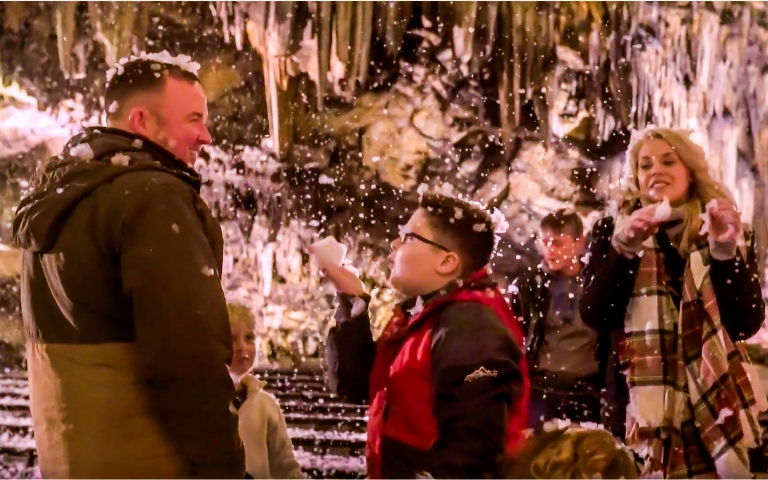 If you are looking for an event that brings the family together in wonder, celebration and joy, we believe our Christmas at the Cave is perfect for you. We have put together a list of twelve reasons to make Christmas at the Cave your special family Holiday Tradition, and some of the list may surprise you! We have wonderful entertainment lined up for your special Christmas Event to share with friends and family! We’ll be featuring the talented and incredible Tinseltone Quartet (as seen on Dr. Phil and Good Day LA)! They will be singing outside in our Festival area then perform our “Memory of Christmas” show inside the Majestic DeSoto Caverns. Our special guest, Saint Nicholas will be making all things jolly and bright! Make sure to bring your young believers for some unforgettable time with the big man himself. We will be offering time for photos with Saint Nicholas and story-time with Saint Nicholas in our festive red tent! Your photos with Saint Nicholas will be available for purchase for only $9.99 for both a printed 5x7 photo and a link for the online downloadable file! During your time at Christmas at the Cave we will have dance party moments, quizzical characters, and more! Don’t miss our exuberant characters in the park, from our kind and caring host characters, to our bold and boisterous Sage Sisters, to our menacing Mistress Folly and her henchwoman. 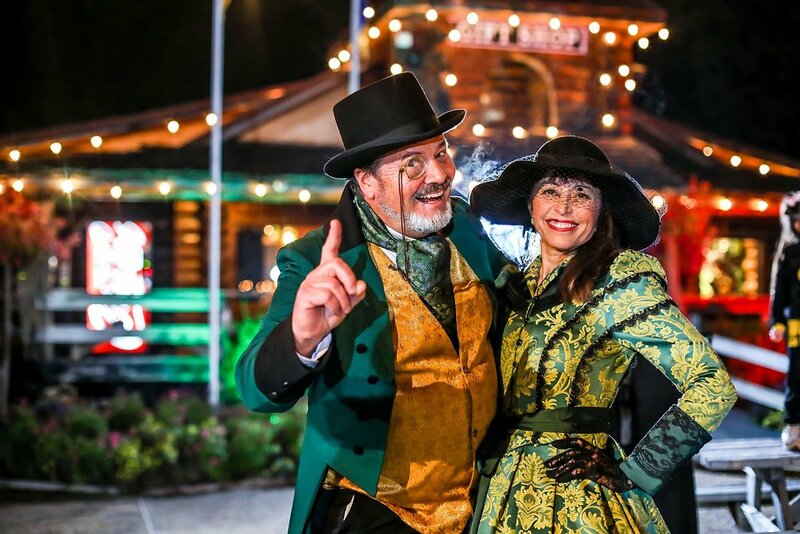 This year you’ll discover new dynamic characters within our park to enjoy! Enjoy some of your favorite classic Christmas movies with loved ones under the stars and by cozy campfires. We will be playing some family-friendly classic favorites in our outdoor movie amphitheatre. 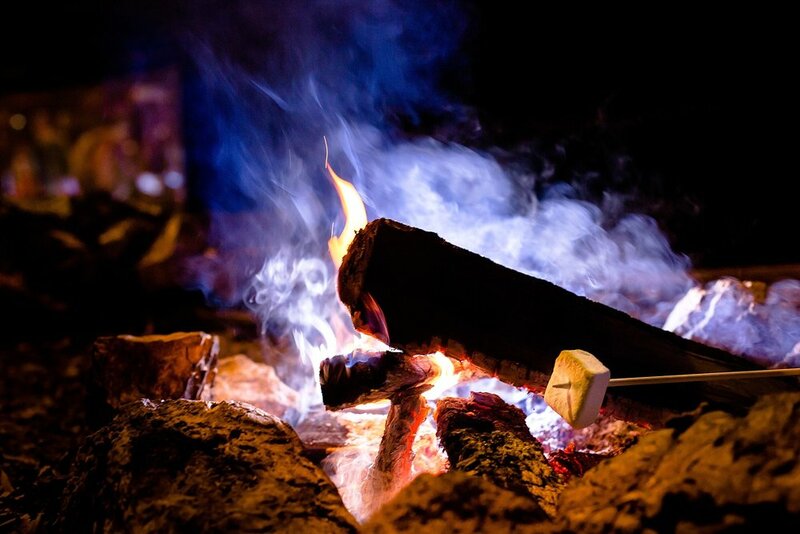 S’more packages are available for purchase in our Gift Shop. 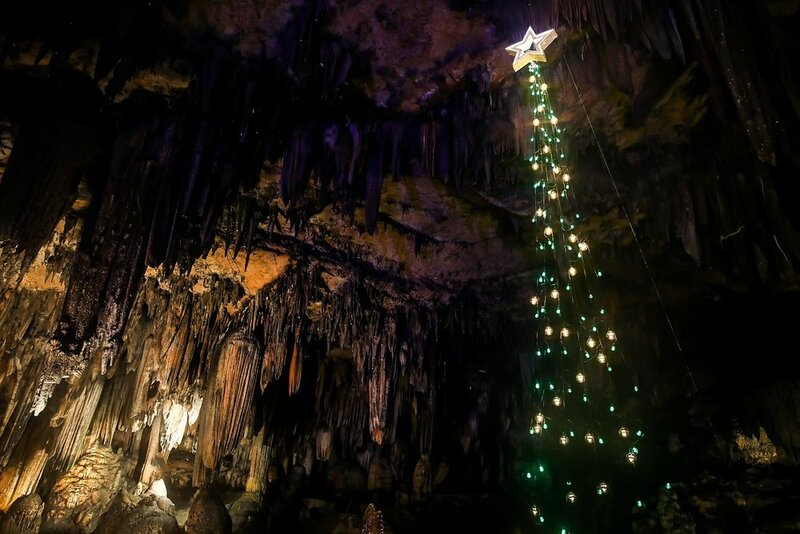 Many say the first Nativity many years ago took place inside of a cave, so what better way to step back into time and reflect on the birth of Jesus than in a caverns setting. As you celebrate Christmas this year, we invite you to step into the peaceful Caverns and think on the miracle that took place many years ago. We’ve been busy away making the experience inside DeSoto Caverns especially magical! There’s no experience like enjoying a show inside the majestic DeSoto Caverns! This special Christmas show includes a story, singing inside the Cathedral room, and sing-a-longs! This is the perfect way to seize adventure during your time at Christmas at the Cave. 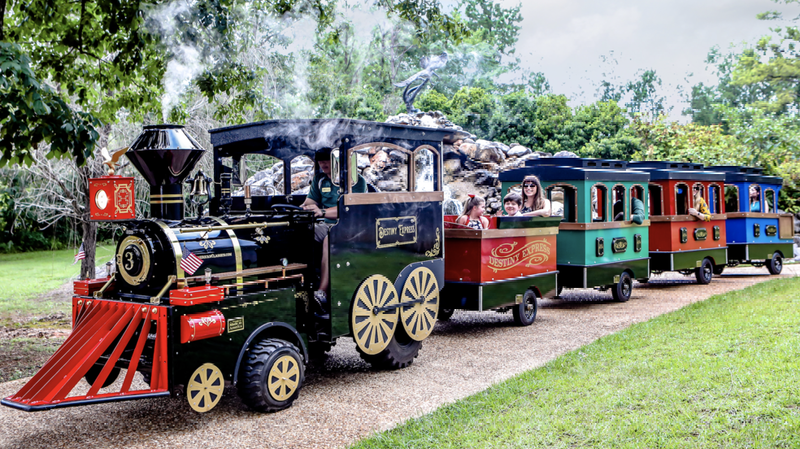 You can purchase park attraction tickets individually, or, if you purchase the Complete Christmas Celebration, this ticket includes a package of 5 park attractions for only an additional $15! This is a 40% savings off of purchasing the tickets individually and is our most recommended pass for families. The park will be twinkling with Christmas lights, but certainly our favorite feature is the green and warm white lights making up the tallest underground tree of lights! This tree reaches to heights of 60 feet inside the caverns! 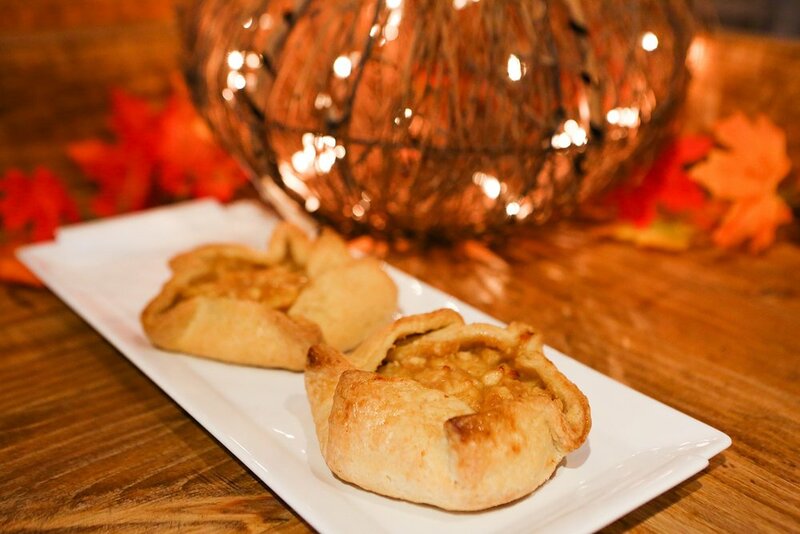 Treat yourself to something sweet, while also making a difference in the world at our Cave Cafe. We’ve made caring for the world delicious through our variety of latte options for the season. From classic lattes such as Caramel, Mocha, and Vanilla, to seasonal favorites like Peppermint Mocha, Cinnamon, Eggnog, and Gingerbread lattes, we guarantee there’s the right cozy drink in our cafe for you! And for those who don’t love coffee, we also have hot chocolate and a vast array of teas to choose from. And while sipping away at your warm drink, remember, every cup of coffee purchased in our cafe provides a hot meal for a child in Honduras! And if you are desiring something more substantial than simply drinkable indulgences, we also have classic and seasonal fudge flavors, apple tarts, sugar cookies, blueberry muffins and more! We will also be offering chicken club sandwiches, hot soups, and hot dogs. This may be a new favorite part of the celebration! We finish off each show in the Cave during Christmas at the Cave with environmentally safe peppermint scented snow! It’s certainly a great way to kick off this season of joy!